Yamaha goes on the attack with home cinema price cuts | What Hi-Fi? Two of its AV amplifiers, the DSP-AX863SE and DSP-AX763, are reduced, along with three of the company's all-in-one Sound Projector speaker systems. 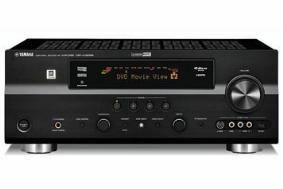 The DSP-AX863SE (illustrated) falls £200 to £599.95, while there's £100 off the DSP-AX763, bringing it down to £399.95. The biggest cut of all comes on the YSP-40D Sound Projector system, which is down £300 to £899.95, while there's £200 off the YSP-30D, making it £599.95, and the YSP-60 is £100 less, at £399.95. All the price changes took effect from September 1st.